Advocates rallied for the creation of a new majority Latino district that would span Upper Manhattan, the northwest Bronx and sections of Queens. WASHINGTON HEIGHTS — A groundswell of support is building in Upper Manhattan for what could become the nation's first Dominican congressional district — right in the traditional heart of black politics. The demographics of the district Rep. Charlie Rangel has been leading for more than 30 years have been shifting, becoming more white and Latino, with a dwindling black population. Today, the 15th Congressional District — which includes Washington Heights, Inwood, Harlem, parts of the Upper West and East sides and a sliver of northwest Queens — is 46 percent Latino, 26 percent African American and 21 percent white, the latest census data show. That's an 18 percent drop in the black population and a 75 percent jump in the white population from a decade ago. The current borders of the 15th Congressional District, which includes Washington Heights, Inwood, Harlem, parts of the Upper West and East sides and a sliver of northwest Queens. At the same time, the city is nearly 29 percent Latino, a figure that is up 8 percent over the past decade. With the demographic shift and the need to redraw district lines following the 2010 census, advocates believe they have the opportunity to create a new Latino district with a majority Dominican population, opening the door for a run by State Sen. Adriano Espaillat, who has already made history as the first Dominican-American elected to a state legislature. “It wasn’t a surprise to us, but a surprise to a lot of people, that the numbers have shifted, that the numbers are favorable to our communities,” said Maria Luna, a Democratic district leader and longtime fixture in Washington Heights who now serves as spokeswoman for the Northern Manhattan and West Bronx Coalition for Fair Representation. 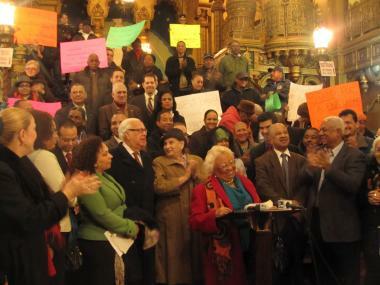 Gathered at the United Palace Theater palace on 175th Street in Washington Heights last week, Luna and many of Upper Manhattan’s other most prominent leaders called on state legislators in Albany to recognize the changes as they redraw the state's congressional lines ahead of the 2012 election. The state currently has two Latino representatives in Congress: Nydia Velazquez in the 12th District, which spans parts of Brooklyn, Queens and Lower Manhattan, and Jose Serrano, who represents the 16th District, anchored in the Bronx. But because the state's population declined in the latest census count, New York is losing two congressional seats, meaning lines must be substantially shifted, with demographic changes taken into account. That has prompted a renewed effort to further concentrate Latino voters into certain districts to increase the likelihood that new Latino candidates will win. One proposal being pushed by the Dominican American National Roundtable would divide Upper Manhattan, where Rangel has long reigned, into multiple districts to create a new majority Latino district with deep Dominican roots, its president, Dr. María Teresa Feliciano said. The district would stretch across Washington Heights, through the eastern part of Inwood and then into sections of the northwest Bronx, including Kingsbridge and Morris Park, and over into Jackson Heights and Corona in Queens, where the Latino population has spiked 35 percent over the past ten years. While the lines would create a district straddling three separate boroughs, proponents insist the area, which would be 66 percent Latino (an overwhelming 85 percent of whom would be Dominican), 11 percent black and 14 percent white, would unite communities with similar interests and needs, including shared language and culture. “We need [a representative] that knows, that comes from our own social, cultural and economic background in power,” said Dr. Rafael Lantigua, a professor of clinical medicine at Columbia University and a member of the coalition. Lantigua added that the three areas in the proposed district already have a great deal of crossover because of their populations. “If you go to 181st Street, you will see the lines of people waiting for the bus, going to do their shopping [over the river]," he said, noting that about 40 percent of his own patients come from outside of Manhattan. A spokesman for the New York Senate Republicans said the legislative committee tasked with re-drawing the districts is still in its early stages and that no maps have yet been drawn. A judge recommended Monday that the whole process be turned over to a special court master to avoid further delays. But either way, the re-drawing will undoubtedly have major implications for Rangel, whose district needs more people, not fewer. While some express frustrations with Rangel privately, advocates stress that they have no desire to pit Latinos against African Americans and that one seat should not come at the expense of another. The Dominican American National Roundtable's proposal for a new majority-Latino Congressional District spanning Upper Manhattan, the Bronx and Queens. But even Rangel has acknowledged that he will likely have to give up most of Manhattan if he wants to hold onto his seat. One plan being discussed would allow Rangel to maintain a small, symbolic, piece of Harlem by extending his district up into the Bronx and Westchester, where demographics are more likely to favor his win. 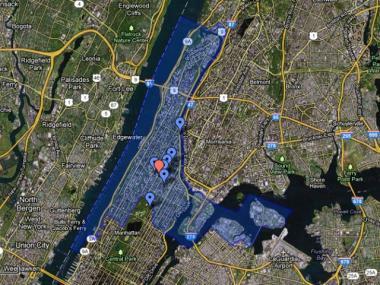 The proposed outline, which Rangel has likened to a dragon, would have its head in Mt. Vernon, its belly swelling up into the South Bronx, and Harlem as its tail, he said. But for a man whose identity is so tightly wrapped in Harlem, the pill has been hard to swallow. "I've never felt so helpless," Rangel told reporters at a recent roundtable in his office on 125th Street of the redistricting process taking place behind closed doors in Albany. "Where could I go to tell someone what my thought are? The legislators are concerned with their lines. That's all they're concerned with," he said. To cover his bases, he said he’s been reaching out to leaders across the region, where his district could potentially stretch. “I'd be damned if I want the district to go to Mount Vernon. I mean, hell, Canada sounds just as likely. But I want to be able to say I called," Rangel said. By concentrating black votes in Rangel’s district to protect his seat, the likelihood also becomes greater that legislators will end up with a new majority Latino district with a high concentration of Dominicans, whose numbers have grown 40 percent in the city over the past ten years. That opens the door for Espaillat to become the nation's first Dominican congressman and the third Latino rep from New York, two years after he won his race to replace Eric Schneiderman, who is now attorney general. The move would also open Espaillat's seat to several former challengers, including Luna and Mark Levine, who ran for state senate. Both are advocating the roundtable's proposed lines. 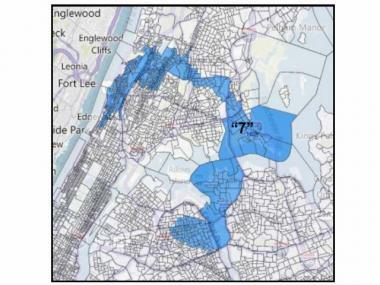 However, observers note the proposed new district could also buoy a candidate from the Bronx, since more of its voters would live there than in either Manhattan or Queens. That could propel someone like Bronx Borough President Adolfo Carrion, who is of Puerto Rican descent and has more than $1 million cash on hand, toward a potential run. At the United Palace Theater last week, Espaillat stood on the sidelines quietly and refused to take to the podium, presumably to avoid the appearance that he was driving the push for a new Latino seat. "This is a movement in the community," a defensive Lantigua said. "It's not [about] a person." Still, Espaillat acknowledged that, though he is focused on his current state senate reelection, the congressional seat is on his radar. "If a new district were to open up, I would take a good, serious look at it," he said, adding that the roundtable's plan received significant support during a series of public hearings before the state’s redistricting committee. “If they don’t respond, they must be deaf,” he said.